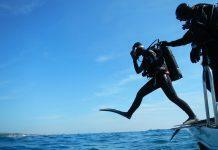 Scuba Diver Q&A: Can orbital floor fractures stop you from diving? Approved Medical Examiner of Divers Dr Oliver Firth answers your questions. Next up, we turn to eyesight. Can orbital floor fractures stop you from diving? Q: I have suffered an orbital floor fracture whilst playing rugby. My doctor has instructed me not to blow my nose due to subcutaneous emphysema (and not to play contact sport for six weeks). Although I have follow up appointments to come, where do I stand with diving, both presently and into the future? A: Ouch, these are nasty injuries. Firstly, some orientation: the orbit is the cavity in the skull which accommodates the eye. Orbital floor fractures commonly result from blunt objects (fists, car dashboards, rugby or any other sort of balls) impacting on the eye socket, which then breaks. Over 80% occur in males (funny that). What actually happens is that the object in question, say a well-aimed punch from Anthony Joshua, squishes the incompressible eyeball inwards. The rapid increase in pressure in the socket then causes it to ‘blow out’ at its weakest point, the floor. The fatty tissue around the eye then drops through the hole, often pulling a couple of eye mus- cles with it, resulting in double vision. And a rapid lie-down. In a victim without visual disturbances, where the fracture covers less than 50% of the floor, and where there’s no trapped fatty or muscle tissue, one option is to leave the area alone and treat with steroids and antibiotics. In more serious cases, however, surgery is needed to reposition the disrupted bony fragments and patch up the fracture with a mesh. One issue with this type of repair and diving is whether there is any possibility of trapped gas within the tissues. This is the ‘subcutaneous emphysema’ your doctor is talking about. After six weeks, I would assume that any gas introduced, through nose-blowing or surgical repair, would have diffused safely away. Otherwise I can’t see (pardon the pun) any reason you shouldn’t dive once you’re fully recovered. Q: I recently woke up with a large floater in my right eye. It’s rather like a gelatinous blob with some black specks randomly moving around in the eye and can cause some blurring. A thorough examination at the opticians revealed that the cause was a posterior vitreous detachment (PVD). My eyesight remains unchanged and there are no signs of any tears or damage to the retina or the surrounding area. The Optometrist advised me to cancel my upcoming diving holiday and to avoid any strain, heavy exercise or lifting. My GP subsequently advised that these conditions normally heal within a six week to six month time frame. The big question is will I be able to dive in six months time, assuming there is no further damage? A: For those in the dark about what a floater is, this description is classic – they’re those tiny spots, specks, flecks and ‘cobwebs’ that drift aimlessly around in your field of vision, never staying still but moving when your eye tries to focus on them. That is because they are shadows, cast by little bits of the eye’s vitreous (the gel-like material that makes up the major part of the eyeball) breaking loose within the inner back portion of the eye. Normally the vitreous is well adhered to the retina at the back of the eye, but a sudden shower of floaters, especially when accompanied by flashing lights, can signify that the vitreous is detaching itself. In tugging on the retina, it can end up tearing it, which is a sight-threatening complication that needs urgent assessment. Thankfully it appears you’ve got away without any retinal damage. In the year after one attack, some sufferers get another bout of PVD in the other eye; but in the vast majority, the floaters subside over anywhere up to three months, and don’t return. If floaters are still present after this time, then various surgical techniques can be employed to treat the problem more definitively. So, to dive or not to dive? Well, I think it’s difficult to countenance it within the six months after symptom onset; but provided your recovery is uncomplicated, diving could be considered after that. Be sure to stick with the advice from the optometrist in the meantime, to give the eye the best chance of uninterrupted healing: the fewer sudden pressure changes, the better.